Name Variation Joseph N. Kittle was also known as Joe. Name Variation Joseph N. Kittle was also known as Joseph O.
Joseph N. Kittle was born on 28 August 1903 at Kansas. He was the son of Silas Milton Kittle and Elizabeth Luiza Isable. Joseph N. Kittle died on 2 May 1981 at North Dakota at age 77. [S243] U.S. Federal Census 1920 U.S. Federal Census, by Ancestry.com, ED163. Dwelling 59. Henry L. Kittle was born on 14 June 1905 at Kansas. Henry L. Kittle died on 11 January 1986 at Wisconsin at age 80. Married Name Her married name was Broomfield. Violet J. Kittle married Ted Broomfield. Violet J. Kittle was born on 25 March 1908 at Kansas. Violet J. Kittle died on 29 December 2000 at Illinois at age 92. John Kittle was born on 28 February 1910 at Kansas. John Kittle died in December 1982 at age 72. John Kittle obtained US Social Security Card at Kansas; last residence Langdon, Kansas. Married Name before September 1918 As of before September 1918,her married name was Kittle. Elizabeth May (?) married Joseph Newton Kittle, son of Stacy Francis Kittle and Emma Jane Kitlar, before September 1918. Margaret Sadler was born circa 1900. Margaret Sadler lived in 1920 at Lisbon, North Dakota. Married Name 30 December 1925 As of 30 December 1925,her married name was Kittle. Bessie Mae Sumwalt was born in September 1898 at Kansas. She was the daughter of Robert R. Sumwalt and Anna Belle (?). Bessie Mae Sumwalt married Elmer Leonard Kittle, son of Silas Milton Kittle and Elizabeth Luiza Isable, on 30 December 1925. Bessie Mae Sumwalt died in 1950. [S245] U.S. Federal Census 1900 U.S. Federal Census, by Ancestry.com, ED16. Dwelling 130. [S244] U.S. Federal Census 1910 U.S. Federal Census, by Ancestry.com, Year: 1910; Census Place: Union, Butler, Kansas; Roll: T624_433; Page: 7B; Enumeration District: 28; Image: 966. [S250] U.S. Federal Census 1930 U.S. Federal Census, by Ancestry.com, ED4. Dwelling 295. Elizabeth Kittle was born circa 1927 at Kansas. She was the daughter of Elmer Leonard Kittle and Bessie Mae Sumwalt. Elizabeth Kittle died before December 1979. Glenn E. Kittle was born on 5 December 1929 at Kansas. He was the son of Elmer Leonard Kittle and Bessie Mae Sumwalt. Glenn E. Kittle died on 6 August 1999 at age 69 Glenn E. Kittle, 69, farmer and truck driver, of Augusta, died Aug. 6, 1999, in Augusta. Services will be held at 10 a.m. Tuesday at the First Baptist Church in Douglass. The Rev. Neal Alford will officiate. Burial will be in Douglass Cemetery. Friends may call at Hilyard-Smith Mortuary in Douglass from 1 to 8 p.m. Sunday and 9 a.m. to 8 p.m. Monday. Kittle was born Dec. 5, 1929, in Wichita, to Elmer Leonard and Bessie Mae (Sumwalt) Kittle. On Jan. 26, 1951, he married Ruth Ann Holmes. Survivors include his wife, Ruth Kittle, Augusta; four sons, Ron Kittle, Sumpter, N.C., Ed Kittle, Augusta, Bill Kittle, Virginia, and Larry Kittle, Washington, Iowa; a brother, Robert Kittle, Douglass; and 11 grandchildren. Glenn E. Kittle obtained US Social Security Card at Kansas; last residence Augusta, Butler, Kansas. Married Name circa 1894 As of circa 1894,her married name was Sumwalt. Anna Belle (?) was born on 15 March 1863 at Iowa. She married Robert R. Sumwalt, son of Joseph Langdon Sumwalt and Huldah Dugan, circa 1894 at second marriage for her; first for him. Anna Belle (?) died on 30 August 1932 at age 69. Anna Belle (?) had 2 with 2 living in 1900 children. She had 2 with 2 living in 1910 children. [S250] U.S. Federal Census 1930 U.S. Federal Census, by Ancestry.com, Year: 1930; Census Place: Burrton, Harvey, Kansas; Roll: 705; Page: 6B; Enumeration District: 2; Image: 24.0. Name Variation James Aaron Sumwalt was also known as Aaron. James Aaron Sumwalt married Jennie Mae (?). James Aaron Sumwalt was born in August 1895 at Kansas. He was the son of Robert R. Sumwalt and Anna Belle (?). James Aaron Sumwalt died in 1949. Rena Antisdel was born in January 1882 at Wisconsin. She was the daughter of Alonzo Simon Antisdel and Emma Duren. [S245] U.S. Federal Census 1900 U.S. Federal Census, by Ancestry.com, ED197. Dwelling 86. Name Variation Stephen Henry Antisdel was also known as Steve. Stephen Henry Antisdel was born on 6 August 1884 at Wisconsin. He was the son of Alonzo Simon Antisdel and Emma Duren. Stephen Henry Antisdel married Lucy (?) before September 1918. On 12 September 1918 at World War I Draft Registration, Milwaukee, Wisconsin. Name Variation Anna Alouise Antisdel was also known as Ollie. Anna Alouise Antisdel was born on 20 January 1888 at Wisconsin. Abbie Antisdel was born in April 1892 at Wisconsin. Name Variation Susan Antisdel was also known as Suzanne. Susan Antisdel was born on 20 February 1894 at Wisconsin. Louis Carl Antisdel was born on 10 April 1897 at Wisconsin. Louis Carl Antisdel married Elenor K. Wink, daughter of Bartel Wink and Elizabeth (? ), before 1917. On 5 June 1918 at World War I Draft Registration, Milwaukee, Wisconsin. [S243] U.S. Federal Census 1920 U.S. Federal Census, by Ancestry.com, ED314. Dwelling 136. Name Variation Elenor K. Wink was also known as Elinor. Married Name before 1917 As of before 1917,her married name was Antisdel. Elenor K. Wink was born in April 1894 at Wisconsin. She was the daughter of Bartel Wink and Elizabeth (?). Elenor K. Wink married Louis Carl Antisdel, son of Alonzo Simon Antisdel and Emma Duren, before 1917. Bartel Wink was born in October 1865 at Wisconsin. He married Elizabeth (?) circa 1890. Bartel Wink died before 1920. Married Name circa 1890 As of circa 1890,her married name was Wink. Elizabeth (?) was born in November 1869 at Wisconsin. 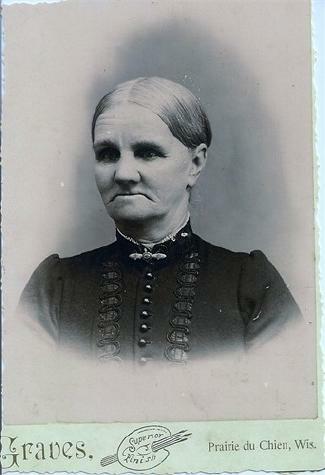 She married Bartel Wink circa 1890. Eugene O. Antisdel was born circa 1917 at Wisconsin. He was the son of Louis Carl Antisdel and Elenor K. Wink. Hilda Wink was born in April 1892 at Wisconsin. Alutar Wink was born in February 1896 at Wisconsin. He was the son of Bartel Wink and Elizabeth (?). Married Name before September 1918 As of before September 1918,her married name was Antisdel. Lucy (?) married Stephen Henry Antisdel, son of Alonzo Simon Antisdel and Emma Duren, before September 1918. Edith Becwar was born in November 1887 at Wisconsin. She was the daughter of Anthony Becwar and Margaretha Stark. [S245] U.S. Federal Census 1900 U.S. Federal Census, by Ancestry.com, ED27. Sheet 1A. (Image on Ancestry.com is incorrect). Andrew J. Becwar was born in 1827 at Bohemia. He married Anna J. Zlabek, daughter of (?) Zlabek, in 1848. Andrew J. Becwar died on 23 September 1871 at Eastman, Crawford, Wisconsin. [S247] U.S. Federal Census 1870 U.S. Federal Census, by Ancestry.com, Page 27. Stamp 431. Dwelling 185. Name Variation Anna J. Zlabek was also known as Slayback. Name Variation Anna J. Zlabek was also known as Annie. Married Name 1848 As of 1848,her married name was Becwar. Anna J. Zlabek was born on 26 June 1824 at Startiz, Bohemia, also reported as July 1824. She was the daughter of (?) Zlabek. Anna J. Zlabek married Andrew J. Becwar in 1848. Anna J. Zlabek died on 6 March 1914 at Eastman, Crawford, Wisconsin, at age 89. Anna J. Zlabek had 9 with 9 living in 1900 children. [S246] U.S. Federal Census 1880 U.S. Federal Census, by Ancestry.com, Year: 1880; Census Place: Eastman, Crawford, Wisconsin; Roll: T9_1420; Family History Film: 1255420; Page: 34.2000; Enumeration District: 43; . [S245] U.S. Federal Census 1900 U.S. Federal Census, by Ancestry.com, ED14. Dwelling. John W. Becwar was born in May 1853 at Bohemia. He was the son of Andrew J. Becwar and Anna J. Zlabek. Jacob Becwar was born in July 1855 at Illinois. Name Variation Anna Becwar was also known as Annie. Married Name Her married name was Chapek. Anna Becwar married Frank Chapek. Anna Becwar was born in 1858 at Illinois. She was the daughter of Andrew J. Becwar and Anna J. Zlabek.